I’ve always been fascinated by cows. I suppose being fascinated by cows could be considered a negative indicator of intelligence, but I prefer to think of it as a love of nature, and a reverence for where my hamburgers come from. As a kid, I helped my cousin in Mississippi get his show cow ready for the fair. “Helped” mainly meant “watched,” as I was a bit of a city slicker, and hadn’t beefed up (sorry!) on my cow fundamentals. But I helped clean and groom the cow, which included a thorough tail bleaching. The tail bleaching, I’ve always remembered, . . .
During our 3-week trip to India over X-mas, Pulao and I went with her family on a 1-week vacation touring the desert state of Rajasthan. We set out from Delhi at 7 AM and the roads were foggy. Extremely foggy. Like white sheets flapping in a cloud. Of milk. Bleached milk. White sheets floating in a cloud of bleached milk and marshmallows, all rolled up in the proverbial pea soup. But really white pea soup. 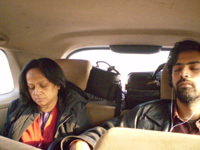 Our driver, Hari Singh, seemed unperturbed by the . . .